Thanks to the efforts of the staff of the Breakdown and Minnesota Hockey Hub, your complete guide to the Class 2A and Class 1A state boys' hockey tournament is now here! Please click on each link to view the team preview, or you may download the entire preview guide (please note, it may take a minute to download the entire guide). 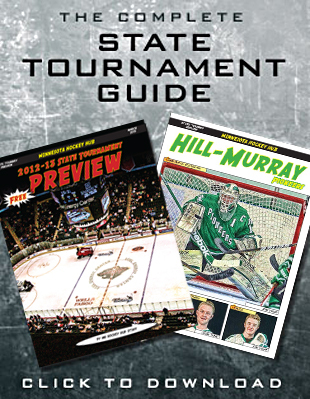 Thanks to the efforts of the staff of the Minnesota Hockey Hub, your complete guide to the 2013 Class 2A and Class 1A state boys' hockey tournament is now here! Please click on each link to view the team preview, or you may download the entire 36-page preview guide (please note, it may take a few minutes to download the entire guide). Print it out at home and carry it to the game with you...or load it on your portable device as a readable PDF!